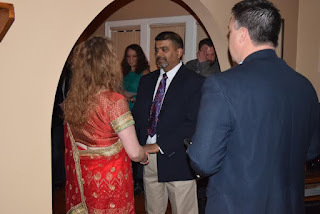 Jennifer, our oldest, was married this year to Sudeep Singh. She and Sudeep are very happy and we are happy for them. Sudeep's is from Hardiwar, India. He comes from a tight-knit family and I know he must miss home a great deal. I'd like to be able to cook some dishes for him that taste like home. I've got a ways to go before I'm that good at it. I bought an Indian cookbook and I've been trying a few easy ones. I made a trip to Spice of India, a local store featuring Indian food items. Jennifer also shared some of her spices with me. Sudeep's mother gave Jennifer some cooking lessons when Jennifer visited there last year so she's ahead of me in Indian cooking. Last week's attempt was Saag Gosht, which literally means spinach-lamb. I followed the recipe except that I cooked the lamb in a slow cooker for three hours before making the rest of the recipe. That way the lamb was very tender. After our great adventures in Boston and Salem, we started heading west but had several more interesting stops to make. We left the Boston area and traveled about 40 miles to Springfield, MA. The Naismith National Basketball Hall of Fame was interesting to both Tom and me. I loved finding a Yopper honored there. Tom Izzo was inducted into the Hall of Fame this year-notice he was born in Iron Mountain, MI. There were several fun displays and here are some of my favorites.